Professor G. D. Yadav is the Founding Vice Chancellor and R.T. Mody Distinguished Professor, and Tata Chemicals Darbari Seth Distinguished Professor of Innovation and Leadership of the Institute of Chemical Technology (ICT), Mumbai, which is a Deemed-to-be-University having Elite Status and Centre of Excellence given by State Assembly on par with IITs/IISc/IISERs. He is J.C. Bose National Fellow and Adjunct Professor at RMIT University, Melbourne, Australia and University of Saskatchewan, Canada. He was conferred Padma Shri by the President of India in 2016 for his outstanding contributions to Science and Engineering. He is internationally recognized by many prestigious and rare awards, fellowships and honours for his seminal contributions to education, research and innovation in green chemistry and engineering, catalysis, chemical engineering, biotechnology, nanotechnology, energy engineering and development of clean and green technologies. He has won over 125 national and international honours, awards, fellowships, editorships, etc. Several Life Time Achievement Awards have been bestowed on him by prestigious organizations. He is an elected Fellow of all National Science and Engineering Academies in India which is rare: Indian National Science Academy (INSA), Indian Academy of Sciences (IASc), National Academy of Sciences, India (NASI), Indian National Academy of Engineering (INAE) and The World Academy of Sciences, Trieste (TWAS). He is a Fellow of Royal Society of Chemistry, UK, Institution of Chemical Engineers, UK, Indian Institute of Chemical Engineers, Indian Chemical Society, and Indian Society for Technical Education, among others. His research productivity is phenomenal: supervision of 99 doctoral and 113 masters theses, 412 original research papers, 91 national and PCT patents; 3 books; h-index of 55, i10 index of 235; 10,700+ citations in journals, patents, books and monographs. He is one of the topmost engineering scientists and academicians in India, who despite being an administrator, is still actively involved in guiding Ph.D., patenting, publishing, consulting and transferring technologies to industry. He has given more than 650 talks including prestigious orations, plenary lectures, keynote addresses and seminars across the world in his illustrious career. He has been an active consultant to industry with more than 70 assignments and over 70 sponsored research projects for past 40 years. He has been involved in many policy making prestigious committees of central and state governments, UGC, AICTE, NBA, CSIR, DBT, MHRD, NAAC, CII, FICCI, etc. He has provided inspiring leadership to the Institute of Chemical Technology (ICT), the Indian Institute of Chemical Engineers (IIChE), Catalysis Society of India, and Maharashtra Academy of Sciences. As President of IIChE in 2001, he changed the face of IIChE and made it a vibrant body. Under his dynamic leadership, ICT has established two new campuses, ICT Mumbai Indian Oil Odisha Campus Bhubaneswar with complete support of Indian Oil Corporation with an investment of Rs 5000 million and partnership of IIT Kharagpur for research and innovation and Marathwada Jalna campus. Since his assuming office ICT has received funds to the tune of Rs 15000 million. Both these campuses will have innovative programmes of education and innovation which will create entrepreneurs and are unparalleled example in India and demonstrate Prof Yadav’s vision and leadership of academia. ICT has won many awards under his leadership including the University of the Year Award by FICCI (2018). He was Leverhulme Overseas Visiting Fellow at Loughborough University (1980-81), PDF/NSERC Fellow, University of Waterloo, Canada (1982-84), Johansen Crosby Visiting Chair Professor of Chemical Engineering, Michigan State University (2001-02) and Distinguished Visiting Scholar, Asian Initiative of Purdue University President (2007), Distinguished Visiting Professor Lunghwa University of Science and Technology, Taiwan, Adjunct Professor at RMIT Melbourne Australia and University of Saskatchewan, Canada. He was honoured with Dr. V. Subrahmanyan Endowment Lecture by IIFPT, Tanjavur (2018), Prof M. J. Nanjan Endowment Lecture by University of Madras (2018), Prof. M.G. Rau Oration by NITK, Surathkal, Syed Hussain Zaheer Medal for Engineering by INSA (2017). VIT Vellor conferred on him Life Time Achievement Award. Deepak Groups Prof L.K. Doraiswamy Chemcon Distinguished Speaker Award and Medal, IIChE (2017), Hetero Drugs Prof G.S. Laddha Chemcon Distinguished Speaker Award and Medal, IIChE (2016) Asian Paints Dr R.A. Mashelkar Chemcon Distinguished Speaker Award and Medal, IIChE (2015). He was bestowed with the first Loknete Sadashivrao Mandlik Memorial Award for his contribution to Education and Research in 2016.D. M. Trivedi Lifetime Achievement Award by Indian Chemical Council (2013) and Dr. B. P. Godrej Lifetime Achievement Award of IIChE (2013). The Indian Chemical Council conferred upon him Life Time Achievement Award and gold medal (2014). The Indian Speciality Chemicals Manufacturers Association bestowed upon him the Best Researcher award in 2014. Dr M. Visvasaraya Life Time Achievement Award by IUFoST (2018)- The International Union of Food Science and Technology. The American Chemical Society (ACS) published a Festschrift (special issue) of Industrial and Engineering Chemistry Research (2014) in his honour with 65 original research papers from scientists from all over the world. He is the Founder President ACS India International Chapter. He is on editorial boards of prestigious journals like: ACS Sustainable Chemistry & Engineering, Green Chemistry, Applied Catalysis A: Gen, Journal of Molecular Catalysis A: Chem., Catalysis Communications, International Journal of Chemical Reactor Engineering, Clean Technologies and Environmental Policy, Current Catalysis, etc. He is the Founding Editor-in-Chief of Catalysis in Green Chemistry & Engineering (2017, Begell House, USA). Other noteworthy recognitions include: Chairman, APCAT-7, Asia Pacific Congress on Catalysis, Jan. 17-21, 2017 Mumbai; Fellow Royal Society of Chemistry, UK and Institute Chemical Engineers UK; Canadian Catalysis Foundation’s Cross-Canada Lectureship; John van Geuns Lectureship, Amsterdam University; Park Reilly Distinguished Speakership, Waterloo University; Visiting Professorship, Lunghwa University of Science and Technology, Taiwan; He is elected Chairman of Asia Pacific Conference on Catalysis, and is on governing council of APCAT, the confederation of catalysis societies from Asia Pacific region. He is a member, International Advisory Board, The State Key Laboratory for Catalysis, Dalian Institute of Chemical Physics, The Chinese Academy of Sciences. He served as Director, Asia-Pacific Confederation of Chemicals Engineering Institutes. He is recipient of honours such as IIT-Roorkee’s Khosla National Award; H.L. Roy Memorial Lecture; RPG Life Sciences’ Padma Vibhushan MM Sharma Medal; Institution of Engineer’s Eminent Engineer Award; Ashland Padma Vibhushan CNR Rao Medal; Dr. Anji Reddy Innovator of the Year Award; Dhirubhai Ambani Oration Award- IIChE-Reliance Industries; Anna University’s National Award for the Most Outstanding Academician; VASVIK Foundation Award for Excellence in Research, Best Teacher Award, Maharashtra Govt. His contributions to development of the Chemical Engineering profession in India are incomparable. As President of the IIChE (2001), he established 51 national awards through endowments. He has been a member or chaired several national and international committees of MHRD, DST, DBT, UGC, AICTE, CSIR, the PSA’s on Green Chemistry, the Planning Commission’s Pan India S&T Committee, and the Government of Maharashtra’s Rajiv Gandhi S&T Commission Peers Group. 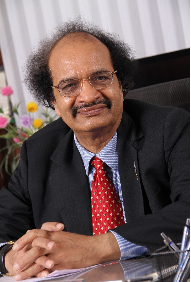 He is Chairman, Research Council, CSIR-CSMCRI, member of RC of IICT Hyderabad and NIIST Trivandrum. He has served as a Chairman/member of Selection Committees of directors of many CSIR labs. He is Chairman, Advisory of DST-National Centre for Catalysis Research, IIT-Madras and international PAC in Chemical Sciences of DST. He is a member of Maharashtra Innovation Council. He is Chairman, Waste Management Expert Committee, DST-Govt of India, and serves on Boards of two companies as independent Director. He has been actively involved as Chairman or member of many policy making committees of UGC, AICTE, NAAC, DST, DBT, CSIR, CII, FICCI, ICC, IIChE, ACS, among others, and is one of the most active scientists and administrators in the World. Recently he was a member of review of functioning of Central Insecticide Board and Registration Committee of Ministry of Agriculture and Farmers Welfare, Review Committee of IISER Pune, Member of Selection Committee of Directors of IIT, MHRD, etc. My vision is to make ICT one of the top 100 institutes in the world in 10 years"